Ackermann’s Repository of Arts, October 1814. 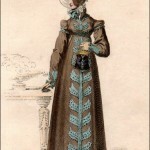 This is one of the most widely reproduced of all Regency fashion prints. I’m sure all of you have seen it in one form or another, but it’s worth studying for the details. The green parasol held by a strap handle at the tip. The shoes laced up like ballet slippers, called sandals, and the shorter length skirt to show them off. The lace ruff collar high on the neck. The quizzing glass on a gold chain. The huge soaring crown of the straw bonnet. (This was the year when bonnet crowns sometimes reached ridiculous heights. In the years that followed, the brims became the focus, achieving enormous pokes.) And the lace cap beneath the bonnet. Anchoring all this lovely fashion detail is the beautifully painted, wistful-looking face. 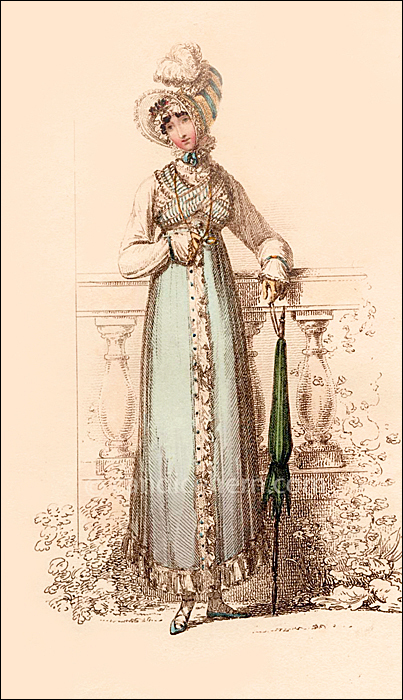 Taken altogether — the fashion, the face, the elegant rendering of the background — this becomes the quintessential Regency fashion plate. 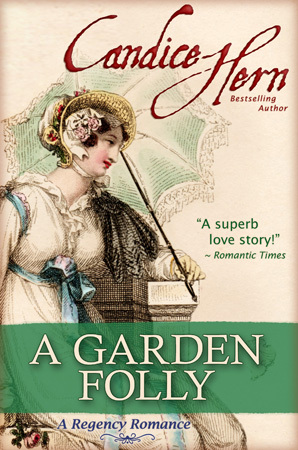 Candice envisioned Catherine wearing a walking dress of pale blue muslin and a high-crowned bonnet trimmed to match the dress when she first encounters Stephen in the gardens at Chissingworth.